Summer object and food icons. 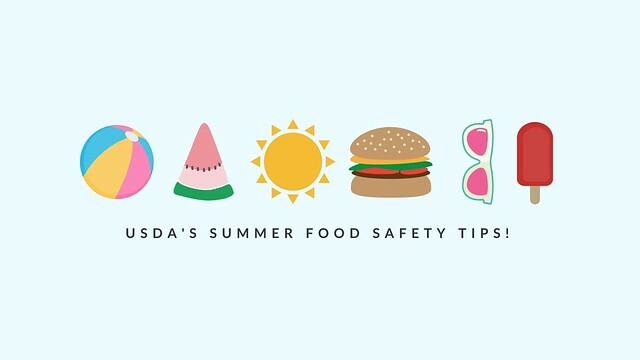 Text: USDA’s summer food safety tips. Question: I fell asleep and left hot dogs and hamburgers sitting out on the counter all night. If I reheat them, they will still be safe to eat, because I’ll kill all of the bacteria, right? Answer: No. Cooking these items may kill the bacteria and other organisms, but it does not get rid of the dangerous toxins formed in the “danger zone” between 40°F and 140°F. Room temperature, of course, is part of that ‘zone.’ Never leave perishable foods out any longer than two hours at room temperature, no longer than one hour when the temperature is 90°F or higher. Those hot dogs and hamburgers left out should be tossed. Question: We grilled our beef burgers to 160°F, as measured by a food thermometer, but they are still pink inside. Are they still safe to consume? Answer: Yes. Ground beef can be pink inside, even after it is safely cooked. The pink color can be due to a reaction between the heat and myoglobin, which causes a red or pink color. It can also occur when vegetables containing nitrites are cooked along with the meat. Because doneness and safety cannot be judged by color, it is very important to use a food thermometer when cooking ground beef. To be sure all harmful bacteria are destroyed, cook ground beef to an internal temperature of 160°F as measured with a food thermometer. For burgers, be sure to insert the thermometer probe into the side of the burger and get close to the center for an accurate read. Question: What’s the best way to travel with perishable food items that will later be grilled at the park? Answer: Pack perishable foods directly from the refrigerator or freezer into the cooler. A full cooler will maintain its cold temperatures longer than one that is partially filled. Meat and poultry items may be packed while still frozen, keeping them colder longer. Be sure to keep raw meat and poultry at the very bottom of the cooler, wrapped separately from cooked foods and foods meant to be eaten raw, such as fruits. If the cooler is only partially filled, pack the remaining space with more ice or cooling packs. For long trips, take along two coolers — one for immediate food needs, such as lunch, drinks or snacks for the car trip, and the other for perishable foods to be used later. Limit the number of times the cooler is opened. Open and close the lid quickly. Question: I’m planning ahead for my family’s trip to the beach, are there any food safety tips I should consider? Answer: Good thinking in planning ahead! Take along only the amount of food that can be eaten to avoid having leftovers. To keep your cooler cool, partially bury it in the sand, cover it with blankets and shade it with a beach umbrella. Bring along disposable moist towelettes for cleaning hands. If dining along the boardwalk. The “danger zone” is between 40 and 140°F, so don't eat anything that has been sitting out in the hot sun for more than two hours (one hour when the temperature is above 90°F) — that would be an invitation for foodborne illness and a spoiled vacation. The hotline helps prevent foodborne illness by answering your questions about the safe food storage, handling and preparation. Live food safety experts with backgrounds in food science, nutrition and health science are available to answer your questions. If you have a question about food safety for your summer activities, call 1-888-MPHotline (1-888-674-6854). Hours of operation are 10 a.m. to 6 p.m., Monday through Friday, ET. Callers may also listen to food safety messages on various topics, recorded in English and Spanish, 24 hours a day. You can also email or chat via Ask Karen and Pregúntele a Karen.